Mapping the position of genes in the cell nucleus sheds light on basic principles governing the genome. 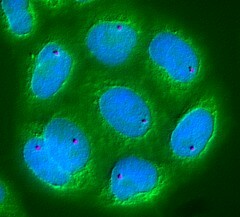 Here, a single gene called Pem (purple) has been localized using fluorescence in situ hybridization. DNA is stained blue; the cell cytoplasm is stained green.